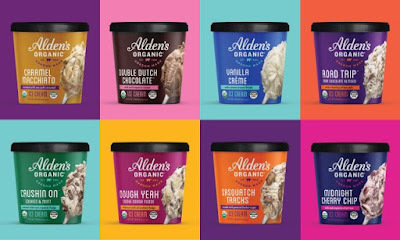 Alden's Organic reveals eight new pint ice cream flavors set to hit stores starting in spring of 2019. - Sasquatch Tracks - Vanilla ice cream with fudge ribbons and peanut butter cups. - Caramel Macchiato - Coffee ice cream drizzled with sea salt caramel. - Crushin On Cookies & Mint - Mint ice cream with crushed cookie pieces and fudge swirls. - Vanilla Creme - Vanilla ice cream with a sweet cream finish. - Double Dutch Chocolate - Swirls of milk chocolate and dark chocolate ice cream. - Road Trip Dark Chocolate Almond - Vanilla ice cream with almonds and salted dark chocolate. - Midnight Cherry Chip - Cherry ice cream with chunks of cherries and dark chocolate. - Dough Yeah Cookie Dough Fudge - Cookie dough and fudge ribbons in vanilla ice cream. Along with the new pints, Alden's is updating the look of their packaging across their entire line of ice cream and are also folding the Julie's Organic ice cream novelties into the Alden's banner starting this spring.